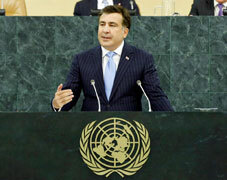 President Mikheil Saakashvili addressed the UN General Assembly on September 25th and harshly criticized Russia’s illegal activities in Georgia. Calling Russia "the last authoritarian empire in the world", Saakashvili said that it "makes him sick when KGB officer Vladimir Putin lectures the world about freedom, values and democracy." In his speech, Saakashvili asked the international community to influence the situation in Russian-Georgian relations. "Yesterday, the occupiers have again expelled Georgian citizens from their homes and villages, the homes and villages of their parents and grandparents." he said. "Despite the efforts of the new government to establish relations, Moscow continues to support the hard line. Russia is against everything new and progressive. Our efforts have been unsuccessful in establishing relations." Saakashvili also revealed his dissatisfaction with the idea of joining the Eurasian Union, which was proposed by the Russian government in 2011. Saakashvili described the Eurasian Union as a new Soviet empire. "The Eurasian Union has been shaped as an alternative to the European Union and unveiled by Vladimir Putin as the main project of his new presidency." the Georgian president said. Speaking about Russian imperialism, Saakashvili said that bordering countries have to face constant pressures and threats. "As I speak, the Eastern European countries aspiring to join the European family of free and democratic nations are facing constant pressures and threats." Saakashvili said. Russian representatives in the UN decided to walk out of the General Assembly hall after the first 20 minutes of Saakashvili’s speech. Russian Foreign Ministry spokesman Aleksandr Lukashevich confirmed that the delegation left the hall in "in a sign of disagreement with the assessments, broadcast by Saakashvili from the podium of the General Assembly." Russia’s UN envoy Vitaly Churkin even advised Saakashvili to undergo a professional mental health assessment. "This time it was not even a statement but merely rambling delusions which were not just anti-Russian but Russophobic and anti-Orthodox in nature. Luckily for the people of Georgia, the political career of this person, whose mental state requires professional evaluation, will sooncome to an end." Churkin said. U.S Ambassador to Georgia Richard Norland described Saakashvili's speech as "very powerful". "There were two things that I think jumped out at me. One is the continuing concern about the borderization process along the boundary lines. This is something I’ve talked about in recent days …The other thing that I think was very important in his speech, if you noticed towards the end of the speech, the president made some comments about mistakes that had taken place during his term in office and the fact that he took responsibility for these mistakes and felt badly about those who have been injured by the government's actions. Our sense was that it was a pretty remarkable statement for a leader to make." Norland said, referring to the part of Saakashvili’s speech where he stated that many "good things" done by his government might have been done "at a very high cost." "In our rush to impose a new reality, against the background of internal and external threats, we have cut corners and made mistakes." Saakashvili stated. Saakashvili’s speech had an immediate impact among Georgian politicians present at the General Assembly. "I strongly believe that the speech was one of the best speeches the General Assembly has witnessed so far." Chairman of the President’s Administration Andro Barnovi said. Georgian Dream leader Davit Saganelidze said that he welcomed the president's decision to admit mistakes during his speech at the United Nations. However, he said it would have been better if Saakashvili had thought earlier about all the problems he listed in his speech.